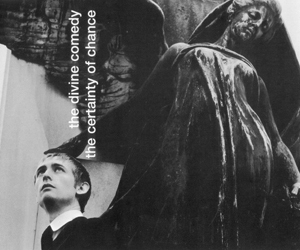 The design for The Certainty Of Chance is black and white, just as Neil Hannon’s suit. The cover photos are black and white. They were shot in Vienna. So, CD1 is black, with the characters transparent. In the same way, CD2 is white. The characters are the same as on CD1. The tape has also a black and white artwork. 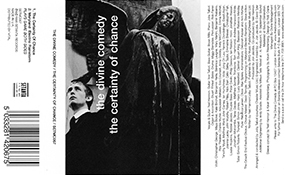 The cover photo is the same as on the CD1, and is drawn out on the back next to the credits. Unlike the CDs, the side and the credits part are white with the name printed in black. Unlike the National Express one, there are no copyrights mentions. 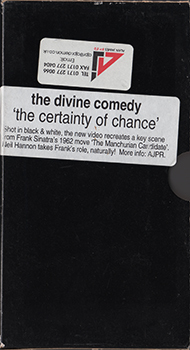 The VHS features the video of ‘The Certainty Of Chance’. 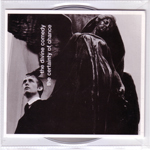 This promotional postcard was given with the Certainty Of Chance promo CD.